I must say it wasn`t easy to choose an appropriate rating for this game. I mean, it isn`t good enough for "Excellent", but I feel that mere "Good" is way unfair. If I were to rate it in numerical scale (including also commercial games), I`d give it 8/10. The game has really low system requirements; it should play flawlessly on virtually any PC, even though it takes some time to load. The main menu is somewhat slow, but good-looking and intuitive. Controls are standard: mouse plus WSAD plus digits, and there aren`t really any extra functions that you might want to care about. One thing: be careful not to hit the "E" key accidentally. Not only it enters the Edit mode and allows you to possibly blow up the map, it also resets all the monsters and your weapons. When I first played this game, I thought there`s something wrong with my graphic card; however, after a few minutes you`ll be unable to imagine DI in full color. Not only does it produce an unique atmosphere, it also adds greatly to difficulty and realism. In this game it`s almost impossible to see a motionless foe when it`s dark, and sometimes they`re hard to spot even when moving. I`m only thankful there are no camping snipers among the enemy ranks. Maybe the AI isn`t very impressive, but numerous enemy types - each with unique abilities - will prevent you for getting bored; plus, the architecture of the maps themselves can be your enemy - with small windows, balconas and shady passages everywhere, there`s no place perfectly safe. However, after some practice you shouldn`t have problems with any of the maps (except the small closed-space ones like Duel or Stonehenge, but they`re clearly not meant for single player), still you`ll need some respect for your foes - jumping into thick melee is never a good idea. In my personal opinion, the most annoying enemy is rhino - they`re fast and have keen eye, and their favourite hobby seems to be decreasing your health while you`re busy with a bauul or the fat zombie guy. Enemies look about as good as the Q2 ones, but there`s one major drawback: there are no corpses at all, enemies spawn some random gibs when killed and those gibs are the same for all monsters. Developers were kinda cheap here; it really looks horrible when you kill a spider, it disappears and a head pops up from nowhere. Plus, when you kill an enemy in mid-air (there are no flying enemies, but it`s possible while a monster is falling off a cliff), the gibs will be floating above ground. The campaigns certainly have some thought put into them and they`re quite interesting, even if not very time-consuming; they can all be easily finished in one or two evenings during the first play. What I mostly play myself though is single-player deathmatch map rotation; because of random enemy spawns and non-linear maps each session is a bit different. 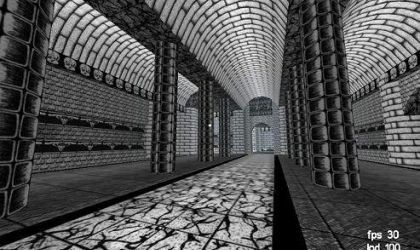 At first you may be quite frustrated, since in most maps a beginner gets killed by the first wave of monsters; however, after a few attempts you`ll find several "hideouts" in which you`ll be able to defend yourself; a narrow passage, a room with one entrace and a window, a curve from which you can see both ends of a corridor... The key to single-player deathmatch is to collect as many ammunition as you can before the invasion begins, and then make a run for one of these "hideouts", preferably one where there`s at least one weapon spawn that isn`t a rocket launcher. 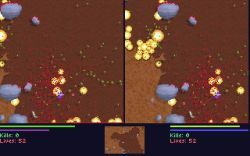 There you should be able to survive the main assault by killing each enemy that comes in your sight; eventually they`ll stop coming, and this means that you`ve defeated the core of enemy army. Now there are only some loners left guarding passageways or stuck on obstackles; it`s time to start exploring the map and finish off the survivors. The only problem is that sometimes it`s very hard to find the last one or two enemies in order to finish the maps; sometimes they get stuck in strange places, giving you a hard time to find them. A minor bug: the game gets stuck when it`s about to load the Duel map in map rotation, but you can still use the Esc-menu to load it. There are only four weapons plus your fists, which is little compared to arsenal in other shooters; however, they`re more than enough to get rid of your foes. Of course, each weapon is useful in different situations; your armory is pretty well-balanced, but not without flaws. For example, I think that the chaingun is a bit too powerful; it does use ammo quickly and it won`t be nearly enough to survive the first wave of monsters, but once you find one or two ammo spawns for it, you won`t really have to save it. And it seems that its bullets don`t have a scatter modifier, making it better on long ranges than sniper rifle; plus, enemy is in a constant flinch when you keep shooting at them. Sniper rifle is fun to use, but it`s either a bit too weak or too slow; usually, you`re better off using rocket launcher, since it is just as powerful and accurate while being more common, enemies aren`t really good at dodging, and it has faster fire rate. The fists are basically what you use when you run out of ammo, but they can also be accessed via switch weapon key while you have only one weapon. I found that they`re surprisingly useful; they can rid of an enemy as efficiently as the shotgun while being faster, and they also have a flinching effect just like the chaingun. Too bad it seems that you can`t use them in any way once you have more than one weapon, and speaking of it, you don`t have any other melee weapon; this is supposed to be a fantasy game, and a full-contact weapon without need for ammo would be very useful in indoor areas. Summary: DI maybe won`t be the game of your life, but it`s your choice when you want to kill (time), and you care more about fun and action than ooh-aah graphics and 20+ different weapons (of which you`ll be using only two or three 90% of the time anyway). I like to play a few rounds of it when I have nothing particular to do; it`s one of those games that you can start and stop playing at any time. And if the developers put its homepage up again and release a few extra maps for it, then it might even remain in gamers` hearts and HDDs for a long time. 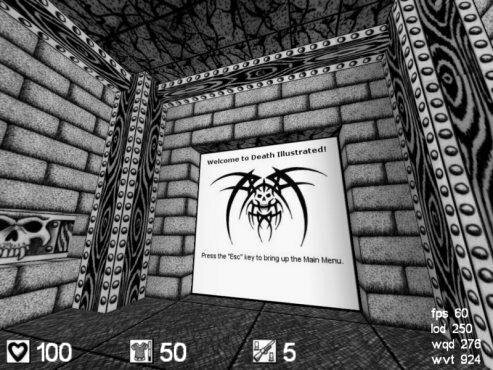 Death Illustrated is like a little Cube: less levels, worse graphics, worse monsters, and, most important of all, less fun. Yes, Death Illustrated is a fun, game, but when compared to a great game like Cube, it falls short. Cube and Death Illustrated share an engine, so the look is very similar, as it should be. However, Death Illustrated has a major difference between it and Cube (and almost every game out there, for the matter.) Death Illustrated is in black and white by choice. This doesn't make the graphics worse, but, the fact that the models and textures seem less detailed (not to be confused with less colorful) makes the game seem a little worse than Cube. Cube is known for its massive amount of levels, but Death Illustrated doesn't compete in this area. Not that the levels are any worse, there's just less of them, and it's easier to get bored. Death Illustrated has one thing on Cube, however: the campaign. Death Illustrated's single player campaign is much more polished than Cube's, and it actually seems more like a campaign from an old Quake game. Overall, Death Illustrated is a fun game that is worth the download. But if you haven't experienced Cube yet, get that first. You won't be disappointed. Where many other first person shooters fail, Death Illustrated passes all scrutiny with flying colors! I compared this game to its full color counterpart by the same creator: Cube. What made this game stick out was that, first of all, it has a main menu with settings that can be tweaked along with the regular in-game menu. This is something that Cube lacked. Another thing that I liked was that opposed to Cube where the monsters seemingly go on forever until you die, this game gives you a ten monster limit, so you know who you're up against and you are less likely to be overwhelmed if you're a beginner like I was. Lastly the music in this game is very good and really helps set the mood that was put into place by the dark and dank halls of the well put together 3D world. The only downside to this game is that the whole black and white effect takes some getting used to. You may find yourself squinting at the screen trying to see further into the depths of some of the darker corridors. Eventually, however you will just give up trying to see whats ahead and just take this as another piece of the game's somber ambience. Overall an excellent FPS and definitely worth the price ...which is free! Death Illustrated is another unbelievable freeware game. Think of Quake 2, but free! Built on the CUBE engine it has totally awesome 3D graphics and the theme for the game is "Deathmatching inside a three dimensional Comic Book". Other than the blood splats from shooting your enemies the game is in black and white, but this doesn't make it score any less, it adds a nice effect to the dark, gloomy and violent game it's meant to be. Grouped with the smooth and well designed 3D graphics is a good soundtrack and decent sound effects. The game play is pretty much that of Quake and other 3D shooters, run around (deathmatch or campaign) and shoot your opponents and the various monsters and bugs that come after you. Pick up extra guns, ammo and health along the way to help you in the game. The cherry on the top of this great game is that you can play it over LAN or over the net. With plenty different maps this game is sure to keep you and your friends entertained for weeks. This game is great. The black and white works fantastic. I don't know why more games aren't made in black and white. Oh yeah, its uncommercial, well anyways this game doesn't care and its great fun. Although be warned it is beta so there is nothing exciting here yet but with the addition of a story to the single player and online play over the internet, this could make a great fun game for anyone to play. Right now it's pretty fun but it needs more real game play. If you have dial-up then don't get it just yet, it won't be worth it unless you really feel like playing it and have some time to spare for the download to complete. But for broadbanders it's worth a look, definitely. More of a story line is what holds this game back from awesomeness. But it's only beta so it can only get better from here. 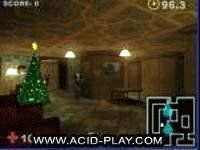 Suprisingly, the guns, monsters, gameplay, and even the maps in Death Illustrated are quite similar to Cube, another FPS (with colour) that used the Quake 2 engine. 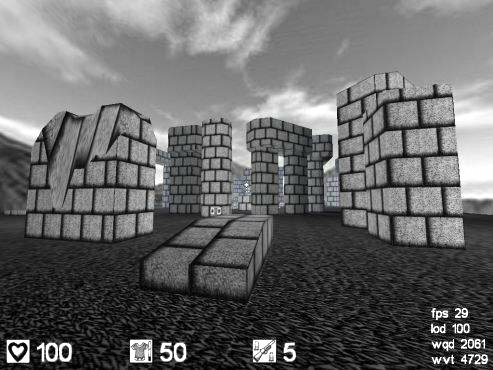 Which means Death Illustrated is a game based on the Cube engine which is based on the Quake 2 Engine! Anyway, those who have played Cube (and are OK with no color) then you may like Death Illustrated. 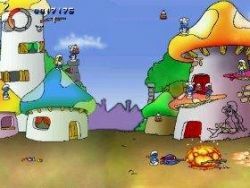 The game sports a (real) menu, campaign mode, and slightly better graphics. Yes, it's another great FPS to download, but personnally I think Cube is still better. 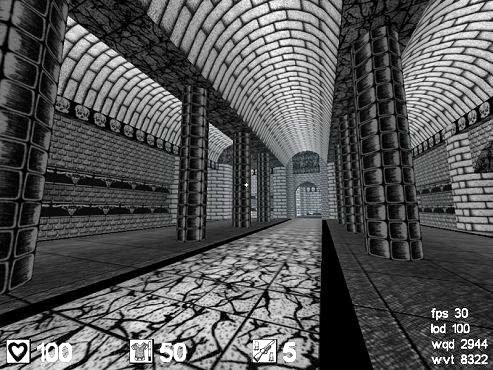 This game is rather great since it offers an even faster game play than Quake and a cool, bizarre black-and-white graphic style. This game is surely pretty hard for the average player because of its speed and the hard-to-hit enemies (which are in fact not less stupid than the foes in the "Serious Sam" games). Nevertheless you should give it a try if you like games like Quake. Oh, and the music is rather cool. You like old-school heavy metal - you'll like this game!